Due to canceled flights, Ewe Knit It will be closed Thursday, April 11, 2019. Sorry for the inconvenience. Take a few moments to look around and see what we have to offer. We have a list of the yarn lines we carry as well as events and classes coming soon. Due to the busy schedules this time of year, Ewe Knit It will not be scheduling new classes until after January 1, 2019. All private lessons/help sessions requiring more than 10 minutes time will be scheduled after regular business hours. Ewe Knit It is now collecting yarn on behalf of Avera Sacred Heart Hospital. The yarn will be used by the inmates at the Federal Prison Camp to make prayer shawls and lap afghans that are distributed through the Avera Pastoral Care Staff. So if you have yarn left over from a project or in a color you don't like stop in and drop it off at Ewe Knit It today! The class registration fee is due at the time of registration and is non-refundable except for the reasons listed below.. If a minimum number of students is registered and there are still seats available, registration will continue up to the time of class. If class needs to be cancelled due to low enrollment, you will be notified at least 2 days before the first class. If an individual session needs to be cancelled due to unforeseen circumstances (e.g. weather, instructor ill), you will be notified as soon as possible and that class will be rescheduled. If class is canceled due to low enrollment or weather, you will be given the opportunity to carry your class fees over to the next class or a different class or store credit in the form of a gift certificate. Due to the amount of prep time the instructor and the shop put into a class, if you are unable to attend class or a class session(in the case of beginning classes) please notify the shop as soon as possible. We ask that any brand specific materials be purchased from the shop and you do not substitute. Please arrive to class at least 15 – 30 minutes early to purchase supplies if you have not already done so prior to class. Only registered students may sit in on class. As such, children or guardians (depending on the class) may not sit in unless they have paid for a full registration. All students are assumed to have the prerequisite skills listed in the class description. The teacher will only be able to assist students without the prerequisite skills as time allows (this can be very limited). Please make sure you are comfortable with the prerequisite skills listed. If pre-work or homework is required for class, please make every effort to have it completed prior to class. Class time is scheduled based on the assumption that students will be ready to proceed from the point of the completed homework. If you need additional help, please visit the shop during regular business hours. The shop will provide a reasonable learning environment including a knowledgeable instructor, access to necessary supplies and an appropriate work area. A shop representative will make every effort to contact you if the class or a class session needs to be cancelled for any reason. You are always welcome to call the shop to confirm the class is being held if you have any doubts. 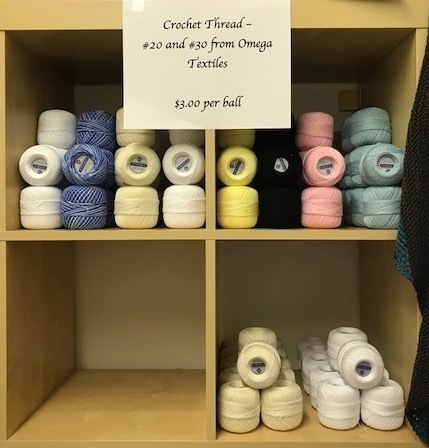 We now have size 20 and 30 cotton crochet thread in limited colors by Omega Textiles! Stop in and see what we have to offer.